CDM’s Cris and organizer Scott Kellog send along word of a mass, 2-day, free festival in Indianapolis Indiana featuring 18 Midwestern artists. Each day will run noon to midnight, so prepare to get your full dose of electronics, folks, tons of music, workshops, seminars, open improvs, and general electronic geekdom. Avant-garde? Absolutely. Stuff you can dance to? Better believe it. Lots and lots of machines? Sounds like. 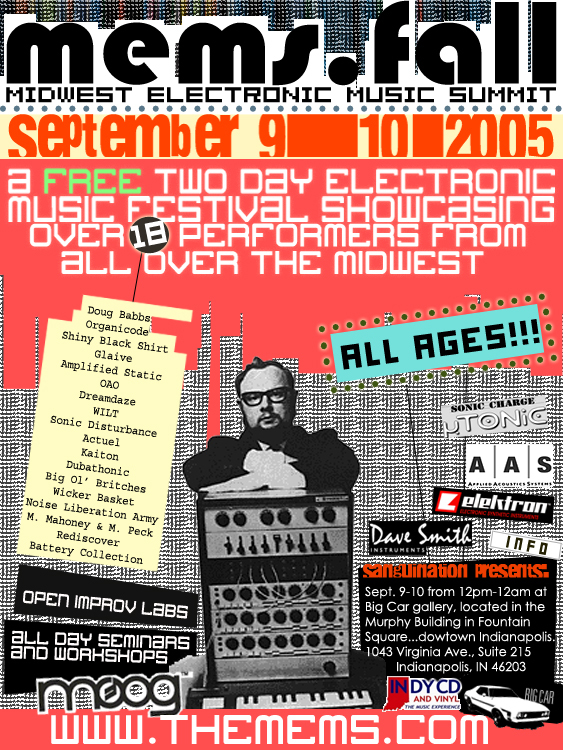 Sanguination Productions is pleased to present the Midwest Electronic Music Summit in Indianapolis, Indiana on September 9th and 10th from noon to midnight. MEMS is a free, all-day celebration of live electronic music, featuring performances from nationwide artists, seminars, and interactive workshops. Rather than spinning records, MEMS performers create music in front of the audience using a wide array of music machines. This event is a one-of-a-kind opportunity for musicians and fans to experience emerging forms of modern music. From the beginning, MEMS has set out to raise awareness of electronic music in all its forms, but especially in the form of live, artist-driven, original music. It provides a showcase for up and coming artists to share their music with an audience of hundreds of open-minded music fans. But MEMS is more than a concert, it is an opportunity for musicians to network and collaborate with their peers during afternoon workshops. These sessions provide a casual environment where artists may swap tricks and secrets of the trade, as well as pass their knowledge on to aspiring new producers. Numerous sponsors from the electronic music community have stepped up to offer their support, including Moog, Elektron, and others. Through their generous donations, MEMS will host a raffle featuring many exciting prizes. But support is not limited to international businesess. Local sponsors, such as Suso Technology Services, Inc. and Indy CD & Vinyl have also been valuable partners in helping MEMS happen. MEMS is hosted by Big Car gallery, located downtown at the Murphy building in the historic Fountain Square Community. Featuring a intimate performance space for mainstage artists, as well as a lounge for workshops and seminars, Big Car is the perfect venue. The “Murph” is home to a thriving arts community which represents the visual arts, theater, and other forms, as well as music. For more information, visit http://themems.com. The Midwest Electronic Music Summit is a not-for-profit event, sponsored by community businesses. If you would like to be involved with MEMS, please contact Scott Kellogg at info@themems.com. Ed: As you regular readers know, I don’t normally print press releases, but this one was labeled a PSA. How could I resist?